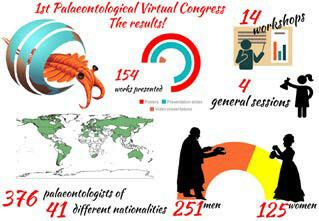 The 1st Palaeontological Virtual Congress was conceived as a typical palaeontological congress but in a completely virtual environment, where researchers from all over the globe could share their work without having the costs usually associated with a conference. The simplicity and efficiency of this new format gave rise to low-cost registration fees and allowed researchers to participate from groups with limited funds and/or developing countries. The success of this proposal was demonstrated by the high number of delegates, with a total of 376 palaeontologists from 41 different countries and five continents registered for this inaugural meeting. For the 15 days duration, a total of 154 contributions were presented in a variety of formats (video presentations, slide presentations or posters), distributed in 14 different workshops that covered topics ranging through taphonomy, palaeoentomology, new methodologies, palaeoart, palaeobotany, etc., and four general sessions (for the complete list of contributions see our webpage at http://palaeovc.uv.es). Also, as with a traditional palaeontological congress, we had three keynote lectures, given by Alex Dunhill (University of Leeds) on ‘A history of the world imperfectly kept: identifying, quantifying and dealing with sampling bias in the fossil record’; Emilia Jarochowska (University of Erlangen-Nuremberg) with her work on ‘Turning biostratigraphy into big data’; and Lars van den Hoek Ostende (Naturalis Biodiversity Center) with a talk entitled ‘The ABC of computer: just a big calculator’. We also managed to introduce important conference aspects, such as field-trips, by adapting them into the virtual format. We developed two ‘virtual field-trips’, in which we showed the dinosaur sites of Alpuente (a locality close to Valencia, Spain), and we ‘visited’ the new Natural History Museum of the University of Valencia where classic zoological and geological collections are held. Furthermore, the organizing committee of the congress has arranged the publication of a special issue of the international journal Palaeontologia Electronica to include a selection of contributions presented at the congress; this will be online during 2019. The issue will help to gain visibility for delegates’ research, a welcome prospect as a great proportion are PhD students and postdoctoral researchers. The success of the conference was a direct consequence of the different organizations that offered support and helped to advertise it with their membership (see a complete list of our sponsors at http://palaeovc.uv.es/index.php/sponsors/). On this matter the organizers are grateful to the PalAss for supporting the event (via Grant-in-aid number PA-GA201808), thereby allowing us to keep the fees as low as possible and allowing the participation of a great number of people with limited resources. We consider that the inaugural congress has accomplished all goals established for this new type of meeting, opening a new way of networking and sharing science in palaeontology. We hope this will be the first meeting in a series of congresses.